There was an additional spectator attraction at the Keith Knox Cheviot Stages Rally. 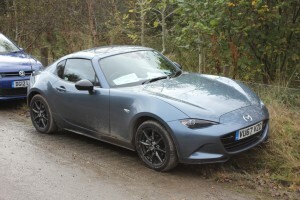 Two big, fat blokes clambering out of a Mazda MX-5. Big Jim had cadged a lift before finding out what I was driving, and I didn’t actually say. Even for a 6ft 4 inch bloke getting in is pretty straightforward thanks to the wide opening doors, but it’s the other end of a journey that taxes the flexibility and agility of the human frame. For the young and athletic, the exit can be accomplished with style and panache, for anyone else it’s best that on-lookers don’t look on. For the elderly and creaky, it’s much more of a pech, pull and heave, unfolding cramped limbs with much creaking of joints accompanying the sprachle. Elegant we were not. Once inside the car, everything was hunky dory, almost. Big Jim filled his space and I nearly filled mine. Thankfully these days, the MX-5 has an adjustable steering wheel. In the first versions, the fixed-column item was difficult to manoeuvre around on the way in, and worse on the way out. Even when ensconced it was a matter of knuckles rattling on knees on every corner. At least it taught you to feed the steering wheel as per the driving test! 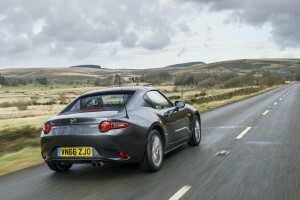 Hard to believe that it’s 25 years since Mazda introduced the most accomplished little two seater and earlier this year celebrated the one millionth MX-5 rolling off the production line. That says a lot about its appeal and staying power. Anyway, we both managed the 100 mile trip to Otterburn – and back, although my big pal probably won’t agree quite so quickly in future. 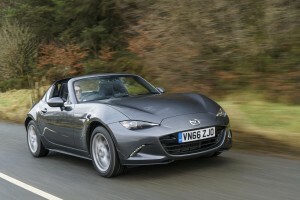 On a more positive note, this was the new hard-top version which has a little more headroom than the soft-top. Both are convertible and both hard and soft top fold away without impinging on the boot space. And therein lies an issue. 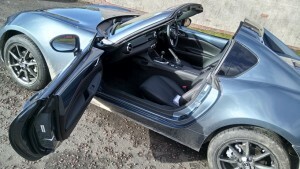 In such a compact little two seater, boot space is a bit of an issue. Two shopping bags and a few French sticks of bread and that’s about it. If going on holiday best to travel light or send your luggage on ahead with ParcelForce or UPS. I even struggled to get a large umbrella in the boot. There’s precious little spare room inside the cabin. I couldn’t even find a place for my notebook. No glovebox or door pockets and the central console binnacles would only be handy for keeping the house keys or a spare set of ear-rings. There are a couple of cup holders but they are pretty much useless for the driver. He/she couldn’t reach and it would up to the passenger to twist round and reach back to get a drink on request. On that basis this is a second car for most folks or a runabout for those young and carefree who aren’t tied down with a mortgage and kids, or even the fortunate few who have retired early and don’t need a big car. 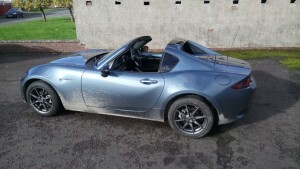 This is a car for enjoying the good weather although well equipped for shrugging off the bad weather. Under ‘normal’ conditions the 1.5 litre motor is ideally suited to a car weighing just a sack of potatoes more than a tonne. The 129 bhp power output perfectly matches the chassis and suspension capability making this one of the best handling small cars in the world. It’s a delight to drive ‘normally’ but with two heavyweights on board, and to be perfectly honest, the wee motor did indeed struggle. On the way home that night we gave it the beans on the long uphill drag on the A68 just north of Carfraemill. There’s a mile long section of road there that opens up to three lanes for northbound traffic to get out and past lorries and tractors. The road was quiet so I dropped it to 4th and floored it. Nothing. Tried third, still nowt. For sure the speed did rise, but a bun in the oven would have risen quicker, as the car struggled with the abnormal weight penalty. This is not a car for those of a pie-fed frame – unless travelling alone – nor is it a car for supermodels with nowhere to put their legs. This is a car for the normal sized amongst us and the young at heart. Would I have one? Like a shot. I really liked the wee thing, but it would need to be a second car. Or perhaps a replacement for those who want to swap their bikes and leathers for something a little more civilised, but still offering plenty of fresh air and the thrill of the open road. At 25 grand it’s a dear wee rascal, but that’s still only twice the price of a top of the range, touring motor cycle.